If you want the full 1500 x 2448 image, you'll have to go to the dA page and click "Download". And yes, it deliberately looks rough and unfinished. I don't have enough confidence in my painting to go into fine detail work(f'r example, Joker's ear), and I wasn't going for realism in the first place. Here's the original, for comparison. I like the original inked version better. It's a nice take on the Alex Ross piece it's inspired by. Anotomically the only issue I see is with the right arm over the head. Something just looks a little off about it. As far as the colors go, what are you trying to accomplish? Is this it, or are you asking what could be improved upon? The light sources on the Joker look good to me, but the light on Harley is off around the midsection of her right hand side. I dunno man, it looks really, really good inked. I was wondering what happened to Harl's right hand myself, but decided to ignore it. I did a lot of tweaking with the colors. This is more or less what I was trying to accomplish chromatically, but the rest of it could stand improvement. Crap. I meant to correct that and forgot. 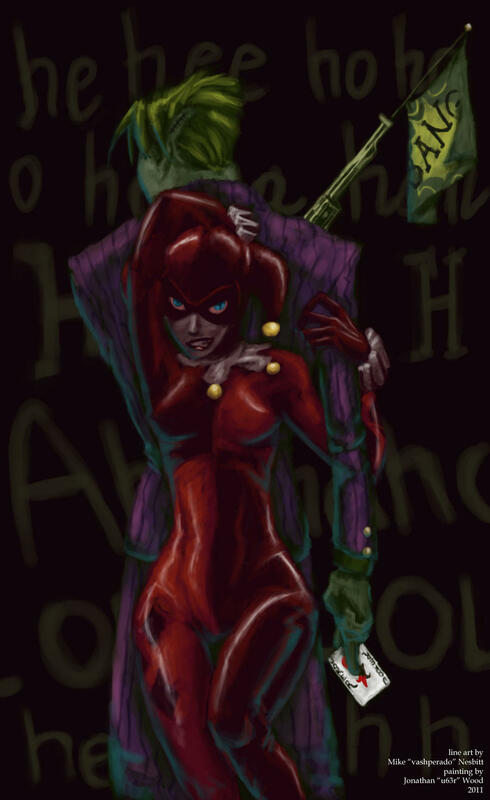 I'm still not sure about the white shiny bits in the "black" areas of Harl's costume. I thought so too. This was supposed to be a simple coloring job on the inked piece, and it ended up turning into, well, this.